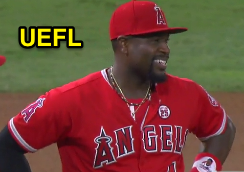 Angels 2B Brandon Phillips tried a sneaky double play in Anaheim before umpires invoked the intentional drop rule to prevent the would-be inning ending maneuver, albeit only after a brief consultation between 2B Umpire Mark Ripperger and 1B Umpire and Crew Chief Tom Hallion. Well, that's one way to try and stop a red-hot Cleveland Indians ball club. Tom Hallion motions to halt Terry Francona. The Play: With one out and one on (R1) in the top of the 2nd inning Tuesday night, Indians batter Yandy Diaz hit a 1-2 fastball from Angels pitcher Tyler Skaggs on a weak line drive to second baseman Phillips, who knocked the ball down to the ground with his glove—ruled "safe" or "no catch" by 2B Umpire Ripperger—and proceeded to execute the twin killing. 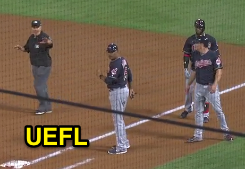 Aftermath: Nearly immediately after 1B Umpire Hallion signaled Diaz out at first base, he called "Time" to consult with Ripperger, who ultimately changed his initial call to that of an air out on Diaz, baserunner R1 Jay Bruce remaining at first base with batter Diaz declared out. The Ruling: Ripperger's final ruling invoked Official Baseball Rule 5.09(a)(12)—otherwise known as the intentional drop rule—which states that the batter is out when, "An infielder intentionally drops a fair fly ball or line drive, with first, first and second, first and third, or first, second and third base occupied before two are out. The ball is dead and runner or runners shall return to their original base or bases." Phillips, who in 2013 demonstrated his exceptional rules knowledge by allowing an infield fly to drop to the ground untouched in Cincinnati and subsequently doubled off a less informed Giants baserunner, smiled as Hallion's crew reversed course and ruled Diaz out for Phillips' intentional drop. Related Post: Infield Fly Rule Knowledge Costs Giants as Reds Turn Two (7/4/2013). Phillips grins as the umpires enforce the rule. Phillips had likely attempted a similar version of the untouched fallen ball trick Tuesday in Anaheim, but Diaz's soft line drive simply was hit too hard to allow it to fall untouched. Legality: The intentional drop is a completely legal play insofar as there is no penalty or base award for an intentional drop because it is not a violation of any rule (recall that the definition of "Illegal" is "contrary to these rules"); if the intentional drop was illegal, it would be listed under Rule 6.00, which is entitled, "Improper Play, Illegal Action, and Misconduct. Instead, an intentional drop, pursuant to Rule 5.09(a)(12) [Rule 5.00 is called "Playing the Game"], is simply one of a dozen circumstances under which a batter may be declared out, just as a standard air out or tag can retire the batter-runner. An intentional drop is a legal way of retiring the batter-runner, which also causes the ball to become dead. When the ball is dead, no bases may be run and no runners may be put out, so an intentional drop can never logically retire a non-batter. It is up to the umpire to enforce this rule correctly. To be clear, the fielder is always allowed to keep play alive by permitting the ball to fall untouched, but deliberately causing a fair fly ball (or line drive in flight) to drop to the ground after making contact with it makes the play liable for an intentional drop call and resulting dead ball. Finally, the infield fly rule (runners on first and second or bases loaded with less than two out; fair fly ball that is not a line drive nor bunt; can be caught by an infielder with ordinary effort) supersedes the intentional drop rule, meaning that the intentional drop rule is not invoked and the ball remains live when the batter has already been declared out under the auspices of the infield fly rule. Related Post: Intentional Drop Rule Stars in Triple-A Midsummer Classic (7/12/17). Related Post: Bernier Burned by Baserunning on Pseudo Infield Fly (7/24/13).